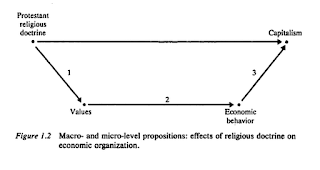 Macro is at the top; micro is at the bottom; and the arrows indicate possible pathways of causal influence. Coleman illustrates his idea with the example of a simulation game. It is this structure which corresponds to the two transitions I have described: macro to micro and micro to macro. The first of these transitions is mirrored in the player's interests, given by the goal established by the rules; the constraints on action, which are imposed by other rules; the initial conditions, which provide the context within which action is taken; and after the game is in play, the new context imposed by others' actions. The second transition is mirrored by the consequences of the player's action: how it combines with, interferes with, or in any other way interacts with the actions of other ..., thus creating a new context within which the next action takes place. Type 4 connections -- macro to macro -- are ruled out ("the macro level is an abstraction, nevertheless an important one"; Coleman 12); so causal influence for macro factors can only work through disaggregated effects at the micro level. We might refer to Type 3 connections as aggregative, and Type 2 as formative; Type 3 represents the composition of the macro-level effect through the activities of individuals at the micro-level. And Type 2 represents the "shaping" or "forming" of individuals that occurs when a macro-level entity affects them -- schools, norms, institutions. Type 1 are connections within the individual's psychology and agency. Udehn characterizes Coleman's position as "structural individualism" (304). What does he mean by this? Here is a brief explanation. He begins by characterizing "institutional individualism," which is itself a loosening of methodological individualism away from the strictures of psychological individualism. Here the distinctive idea is that "the behavior of the social system is the aggregated result of the actions of individuals, or the resultant of their interaction." He then characterizes structural individualism in these terms. 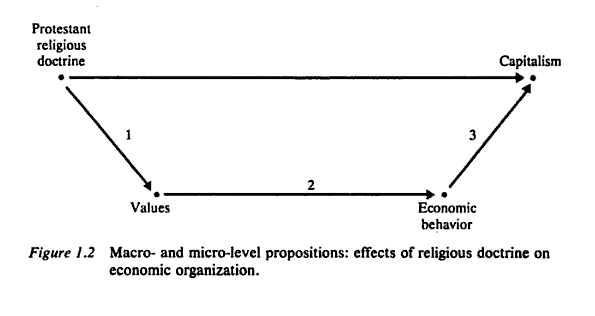 So according to Udehn's interpretation, Coleman diverges from strict methodological individualism in that he admits the "structural" effects of organizations and positions within them: that these system-level characteristics have effects on social behavior at the individual level that are different from the mere aggregation of independent interests among individuals. 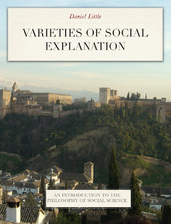 Further, Udehn highlights the fact of socialization: the fact that individuals are socialized by macro-institutions, with the result that their behavior at the micro level is already conditioned by features of the macro value system -- ways of thinking, ways of valuing, ways of interpreting. "Every individual living in society is socialised and internalises, in varying degrees, the values and beliefs prevailing in the society, or group, to which he/she belongs" (301). Hypothesis 1 supports a Type 2 explanation: the moral system of the population as a whole forms the consciousness and moral sensibilities of individuals to become tax evaders; their individual actions aggregate to a low tax collection rate. Hypothesis 3 suports a Type 3 explanation: institutions set the incentives and punishments for all citizens; citizens behave rationally; their choices aggregate to a low tax collection rate. But it also supports a Type 4 explanation: a poor enforcement regime leads to low tax collections, which leads to weak ability to fund naval expansion. What I have objected to in this picture, without formulating it very clearly, is that it seems to require social explanations to proceed through the actions of individuals. Essentially it seems to imply that only agent-based simulations will provide acceptable explanations of "macro-macro" effects; which means that we are compelled to give up the Type 4 (macro-macro) explanation in favor of a trip through Coleman's boat, formalized with an agent-based simulation. The position I would like to defend is two-fold and is a defense of Type 4 explanations. First, macro entities (organizations, institutions, normative systems) have stable characteristics with behavioral consequences. Second, those entities must have microfoundations; we must be confident that there are individual behaviors at lower levels that support these macro characteristics. But third, it is legitimate to draw out the macro-level effects of the macro-circumstance under investigation, without tracing out the way that effect works in detail on the swarms of actors encompassed by the case. I've referred to this possibility as "relative explanatory autonomy" of the meso-level (link, link, link). And the requirement of microfoundations is not a requirement on explanation; it does not require that our explanations proceed through the microfoundational level. Rather, it is a condition that must be satisfied on prima facie grounds, prior to offering the explanation. Elster is not only a proponent of rational choice, but of methodological individualism as well, and he seems to share the common presumption that the two are inseparably linked. By 'methodological individualism', Elster means 'the doctrine that all social phenomena -- their structure and their change -- are in principle explicable in ways that only involve individuals -- their properties, their goals, their beliefs and their actions. Methodological individualism thus conceived is a form of reductionism. I wonder how Levi Martin deals with Coleman in his last book. As you probably know, there are in physics many examples of systems that admit microscopic and macroscopic examples. The canonical example is thermodynamics, which can be given a microscopic basis in terms of statistical mechanics. In practice microscopic-macroscopic explanations do not exclude each other. Established macroscopic laws constrain microscopic theory. And microscopic models can be used to find new macroscopic laws. Even when a well established microscopic foundation is available, there are systems for which microscopic explanations are unfeasible and one has to rely on purely macroscopic reasoning. Reductionism, in a word, does not work in general.